As an artist I'm constantly trying to capture the spirit or mood of the moment and put it on canvas for everyone to enjoy. 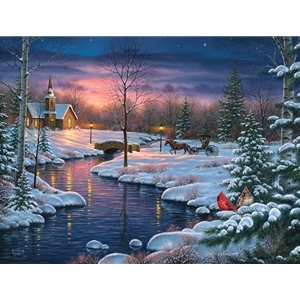 In this painting, I wanted to contrast the cold and frozen winter landscape with the warm glow of the beckoning church. The warmth of God's love draws us to Him. So I chose the warm light of the church and sunset to draw your eye into the painting. I wanted to create the birds and rabbit in the snow, hunkering down for the night. They'll stay warm and cozy, enjoying the peaceful setting until they doze off. Soon the church will be filled, and the night air will ring with the songs and hymns of the congregation. I hope you enjoy this new painting, and I hope that it brings a sense of warmth, joy, and comfort to your home.